You will be able to access the live feed from www.westmancom.com when council meetings are held. Click here for instructions on how to stream meetings live on the web. You can now livestream regular council meetings to your iOS device via the City of Brandon's YouTube streaming channel. A list of council meeting dates can be found here. Archived videos from regular council meetings are available on the City's YouTube account. Visit www.westmancom.com and select your community from the list. 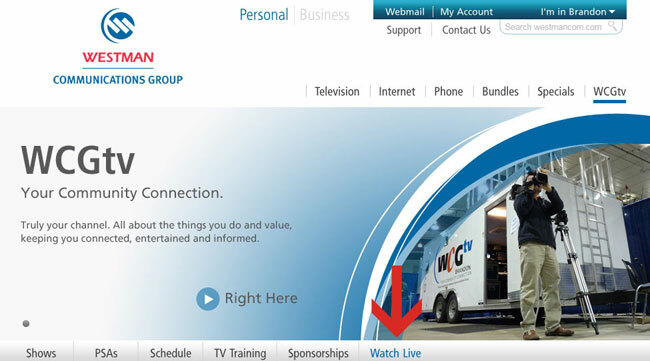 Select the link "WCGtv" from the top navigation (shown below). Select the link "Watch Live" (shown below).